The Appia ii Compact 2 Group commercial coffee machine exists as the traditional coffee machine invented for businesses who want to offer their customers excellent coffees and lattes, yet operate in small spaces. Measuring only 55 centimetres in width, the Appia ii Compact 2 Group coffee machine offers a high performance alongside a safe operating environment. The compact build of the Appia ii Compact 2 Group includes an automatic back flushing, two steam wands, single hot water wand, work tray, ergonomic porta filters, as well as raised group heads. This model can withstand 220 volts and weighs at an adaptable 45 kilograms, despite the 7.5 litre boiler featured. Further product features includes the SIS (Soft Infusion System), in which guarantees a soft and creamy espresso shot to satisfy your customers. 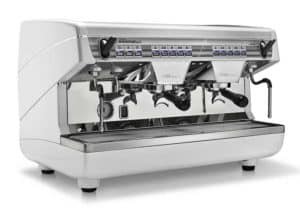 This is combined with the auto-steam option, as the auto-steam wand allows the operator to serve smooth milk-based drinks, since it remains at the same temperature with the right amount of foam. Ultimately, the Appia ii Compact 2 Group commercial coffee machine offers high quality coffees in which satisfies your customers.